The world is feeling the heat of Global Warming, Businesses are also taking the responsibility by taking green initiatives like using green power, reducing emissions etc.,Another reason for Global Warming is the rapid deforestation for making products like paper. To limit the use of paper for printing of unimportant documents, World Wide Fund For Nature (WWF) has introduced a new green file format : WWF, which is very similar to the PDF but with one difference ie., it “Disables the Print Option” of the file, so that no one wastes paper in printing the document. To create a file in the new WWF File Format, First download the WWF Software which adds a virtual printer which can output the files in WWF File Format.The WWF File Format files can be opened by any PDF reader.Any file can be converted into the WWF Format by simply printing it by selecting the printer “Save As WWF” which outputs the WWF File. 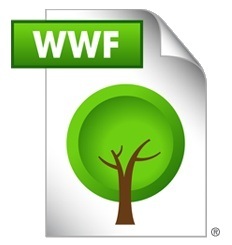 A page is automatically added to the end of each WWF document, explaining the purpose of the new WWF file format to first-time users. WWF File Format Converter is available in 4 languages (German, English, Spanish, French) and is compatible with Mac OS and Windows OS.